Product Condition: The Apex GTX Gaiter is in Excellent condition. These gaiters were previously owned for three weeks. The following observations were made regarding these item. *They were lightly used for an occasion. *There aren't any defects in them at all. *They got minor lint/dirt/dust, cleanable. *The original vendor tags are missing. *All items sold as is, all warranties void. 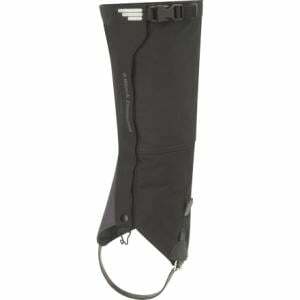 The Black Diamond Apex GTX Gaiter is like the huge, pissed-off bouncer at the door of your favorite bar. Water and snow try their hardest to get in your boots and up your pant cuffs, but this full-height, welded Gore-Tex gaiter beats them back like the canâ€™t-hack-it chumps that they are. The nylon-coated strap and lace hook keep the Apex securely in place, and nickel-plated adjustment buckles ensure long-lasting durability.